Wellington (AFP) – Anti-whaling nations including the United States on Friday warned environmentalists and Japanese whalers against taking action that endangers human life as an annual confrontation brews in the remote Southern Ocean. Australia, the Netherlands, New Zealand and the United States said in a joint statement that they respected the right to protest on the high seas, provided it was non-violent and conducted safely. “However, we unreservedly condemn dangerous, reckless or unlawful behaviour by all participants on either side, whether in the Southern Ocean or elsewhere,” they said. Sea Shepherd campaigners set off for Antarctic waters on Wednesday saying they expected increased aggression from the Japanese fleet after their harassment tactics kept the cull to a record low last season. The hunt netted just 103 minke whales, less than half its tally the previous year, and no fin whales, with Japanese authorities blaming “unforgivable sabotage” by activists. 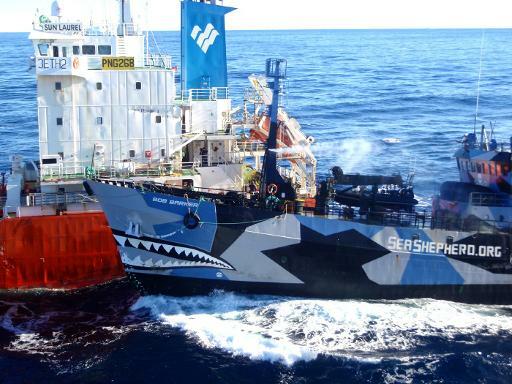 High-seas clashes between the groups are common and Sea Shepherd, which has sent three ships to the Antarctic this year, regularly pelts the whaling ships with stink bombs, attempts to foul their propellers and manoeuvres vessels between harpoons and whales. Last year, the environmental group claimed that a Japanese boat had rammed its vessels on multiple occasions — destroying masts and a radar on the Bob Barker and leaving it without power. The Japanese claimed their boats had been rammed by the campaigners in what was the worst confrontation in the Southern Ocean since a January 2010 collision in which Sea Shepherd’s Ady Gil sank. “Incidents during the last whaling season clearly demonstrated the dangers involved,” the anti-whaling nations said. They urged the masters of all vessels involved to do everything to prevent collisions “in order to avoid the risk of loss of life or injury and damage to property or the marine environment”. Japan says it conducts “scientific research” that is permitted under an international ban on whaling, but makes no secret of the fact that the mammals ultimately end up as food. The anti-whaling nations said they remained “resolutely opposed” to Japan’s practice as lethal research techniques were not required.